The Difference An MBA Can Make To Your Salary [Infographic] - Lead Grow Develop shares insights on Leadership, Productivity and Personal Development. Join us during our weekly #5MinMotivation series and boost your inspiration. When you want to be able to earn more money, you can spend some time thinking about how exactly you’re going to do that. You may even have a huge career plan that you’re following to get to the top (and find the top income too). But that’s not always the case. Sometimes you can feel stuck. Sometimes you can feel like you’re not really on the right track. And when this is the case, how are you going to be able to earn more? Well, one of the simplest answers is found in going back to school. You may not have gotten your master’s when you finished college, but it’s never too late. And the best thing is, you can often earn more with a master’s. 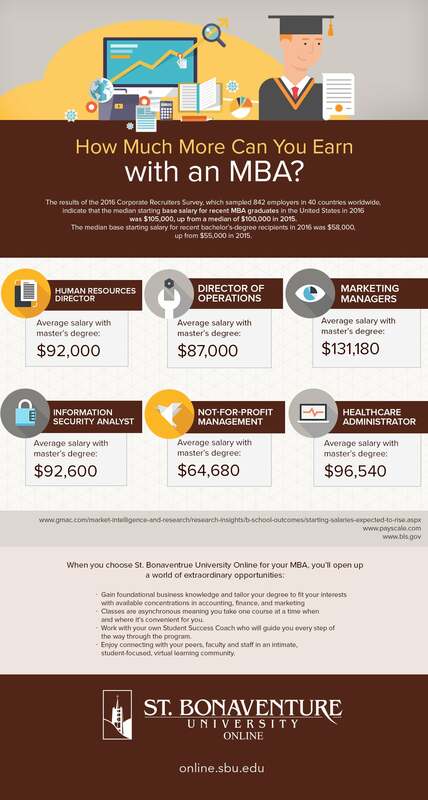 The infographic below shows the medium base starting salary for bachelor’s graduates as $58,000. But for master’s, it’s $105,000 – and that’s quite the difference. Let’s also take a look at some of the salaries that you could look to see with an MBA, and the job roles that they belong to. If you’re interested in working in the not-for-profit sector, then you could be looking at this kind of salary in a management position. Perhaps you’re more into information technology? Then this is the kind of salary you could expect as an information security analyst. Finally, if you love marketing and PR, then this is the kind of salary you could receive as a manager. For more information and further examples, just take a look at the infographic below.